Here on Little Letters I like to write about paper, crafts, photography and anything art related...BUT my other BIG passion in life is Snowboarding. 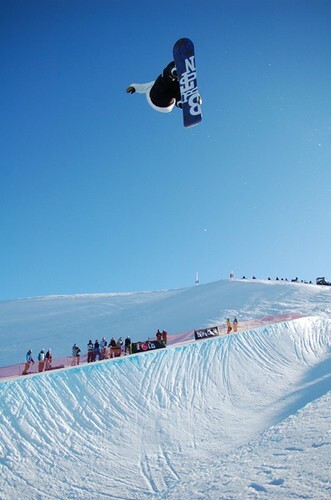 in action at the Winter Games last year in New Zealand. I choose not to ramble about my snowy obsession here, I focus those thoughts elsewhere on women's snowboarding website www.powderroom.net. I have been involved with the site since the early days, almost right from the start when I wrote about my first (and only) full working snow season. Anyway I digress, I have found a way to intertwine my snowboarding side with my artistic interests. I have started a series of stories on the artists and designers behind snowboard graphics and clothing design etc. My first in the series is with the wonderful Amy Ruppel I think I may have first seen her work on Design*Sponge and headed to her site to see that she had actually done some design work for a couple of snowboard companies. Amy agreed to answer some of my questions and here is my article Artist Behind the Graphics Series for Powderroom. categories "Burton", "Design", "Graphics", "Snowboard"